French daily Le Monde has recovered its Twitter account after it was hacked by the Syrian Electronic Army (SEA), notorious for attacks on Western media accounts, including the Daily Telegraph, the New York Times, BBC and CNN. "Hackers from the Syrian Electronic Army attempted to take control of the Monde.fr Twitter account and managed to infiltrate our publishing tool before launching a denial of service," Le Monde said on its website. 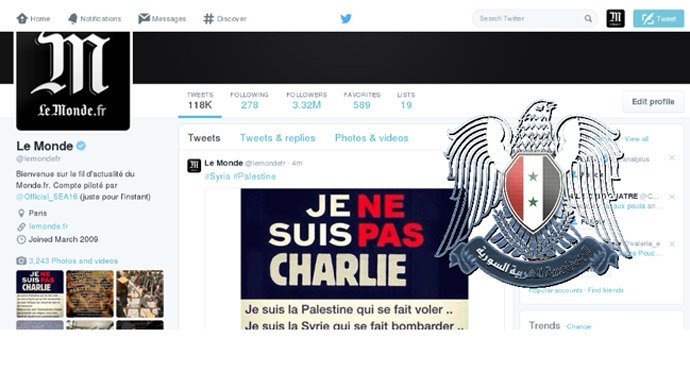 Signs of hacking emerged late on Tuesday, when the Syrian Electronic Army’s logo appeared in a tweet sent from the official Le Monde account. The hackers also posted the message "the Syrian Electronic Army was here" in French, followed by the hashtags #SEA and #Syria. Another tweet posted by the group read, "Je ne suis pas Charlie" ('I'm not Charlie'). Shortly after the tweets appeared, Le Monde’s account was suspended and it was impossible to access it. However, the newspaper’s account was restored within a matter of hours. In late November, the Twitter accounts of a number of British and North American media outlets, the Independent, Evening Standard, CNBC as well as retailer Wal-Mart's Canadian unit, were allegedly hacked by the Syrian Electronic Army, which supports Syrian President Bashar Assad. Visitors to the sites were met with random pop-up messages accompanied by a blank screen saying: 'You have been hacked by the Syrian Electronic Army (SEA)'.